Consumer Action joined the Department of Defense’s Financial Readiness Campaign at the launch of its annual Military Saves week, held at the Camp Pendleton. As February drew to a close, Consumer Action joined the Department of Defense’s Financial Readiness Campaign at the launch of its annual Military Saves week, held at the Camp Pendleton Marine Corps Base in San Diego, CA. The Military Saves program encourages servicemembers and their families to save money, reduce debt and build wealth by offering them relevant and timely financial education. For the second year, Consumer Action’s community outreach and training manager Linda Williams was invited to give a presentation at the base to mark Military Saves Week. Williams, the proud mother of a marine who is currently stationed at Camp Pendleton, seized the opportunity to discuss the very timely topic of data breaches, just as the public was beginning to learn more about the massive data breach at Target. Staff Sgt. 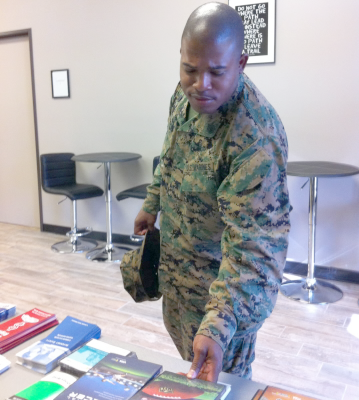 Jameel L. Taylor—son of Consumer Action’s community outreach and training manager Linda Williams—peruses publications at the Military Saves Week event. Williams talked about different forms of ID theft such as financial, medical and criminal, and explained how being a victim of a data breach increases a person’s vulnerability to identity fraud. Using Consumer Action’s newly revised MoneyWi$e identity (ID) theft module, Williams stressed the importance of regularly checking one’s credit and specialty consumer reports, adding that a fraudulent credit history, even one resulting from ID theft, could endanger a servicemember’s security clearance. She told participants that recent reports indicate that more than 13 million people were victims of fraud in 2013, with account takeover fraud accounting for 28 percent of all ID fraud. The 2014 Identity Fraud study released by Javelin Strategy & Research also reported that consumers whose Social Security numbers were compromised in a data breach incident were five times more likely to become victims of fraud than all other consumers, and 14 times more likely to become a victim of “new account” fraud. Williams told the audience to pay close attention to any notifications or letters they receive from financial institutions, including credit card providers and retailers, especially if they receive a notice that their personally identifiable information was stolen. She advised those who become victims of a data breach to consider accepting free credit monitoring services and, if there is a possibility that their Social Security numbers were compromised, to consider placing security freezes on their credit reports. A credit freeze is one of the strongest ways to guard against ID theft after a breach because it blocks a credit report from being accessed by potential creditors, thwarting scammers who may be trying to get credit in your name. Consumer Action, NCLA and U.S. PIRG created an alert with steps to take for victims of a data breach. Click here to read the alert.